More than 60 of the region’s top chefs will create dishes reminiscent of their favorite summer memories offering guests the unique opportunity to sample an array of Southern California’s finest restaurants all in one weekend. Surrounded by music and a gentle ocean breeze, indulge in over 100 wine, beer and cocktail stations on the soft sands in Newport Beach. In addition to SoCal and Napa’s most decorated wineries, Stella Artois, Bacardi rum, Sauza Tequila, Sky Vodka, Aperol Spritz and the Maker’s Mark touring truck will be onsite pouring refreshing crafty cocktails. Guests will enjoy all new summer experiences including the Paella and Sangria Lounge by Villa Roma, Summer Wine Garden featuring beautiful chilled wines to pair with bites by SideDoor and Haute Cuisine, Taco & Beer Lounge by Towne Park Brewery and Chela’s Mexican Restaurant, the debut of the official “Pacific Burger” by Burger Boss at the Lynx Backyard Grilling garden, Golden Spoon Café featuring summer gelatos and affogatos and more mouthwatering moments. Single day general admission tickets are currently $115 for Saturday and $99 for Sunday which includes extended early bird pricing. Single day VIP tickets are $149 for Saturday and $139 for Sunday with extended early bird pricing. Purchase of VIP ticket grants 1-hour early admission at 1 p.m. and access to the grassy waterfront VIP courtyard featuring the Hornitos lounge serving fresh summer margaritas, the Perrier Jouet Champagne Gazebo, aged Bacardi rum cocktails, premium wines and an exclusive culinary experience provided by Back Bay Bistro, Bluegold, Farmhouse at Roger’s Gardens, Filomena's Italian Kitchen & Market, Lauren Lawless from Masterchef Season 8, Mix Mix, Mixed Bakery, Provenance, Sadie Rose Bread & Cabot Cheese and The Country Club. VIP tickets are very limited. Weekend two-day passes are sold out. Chris Paul – Chef, The Public House by Evans Brewing Co.
Pacific Wine & Food Classic is an incredible world-class culinary experience. Taste bites from local top chefs, explore over 100 wines and hand crafted premium cocktails. Enjoy celebrity chef demonstrations, master sommelier discussions and summer mixology demos. Taste the flavors of summer as the region’s top chefs and mixologists create dishes from their favorite summer memories. 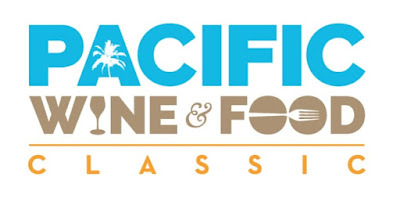 The Pacific Wine & Food Classic is a fantastic gourmet experience on the beautiful soft sand in Newport Beach, you'll be surrounded by music and ocean breezes while enjoying the region’s top chefs. Charity: The success of this great event depends on our wonderful culinary community. Net proceeds will be given to Golden Rule charity as the beneficiary of the Pacific Wine and Food Classic in order to give back to the restaurant industry that works so hard. Golden Rule is a local charity founded to give back and support those in need IN the restaurant industry. Golden Rule Charity administers grants and acts as a liaison between the community and those faced with an unanticipated crisis. Big or small.